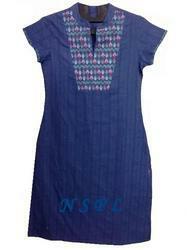 We have marked a distinguished position in the market as a manufacturer and wholesaler of Ladies Cotton Kurta. Manufactured in adherence with the prevailing market trends using fine quality fabrics and yarns, these kurtas are widely demanded in the nationwide market. Designed in different sizes, designs and patterns, we aim to fulfill the exact demands of customers in efficient manner. Well-known in the market as a manufacturer and wholesaler, we are engrossed in offering our clients with a commendable range of Cotton Kurtis. Can be accessible in diverse range of patterns, designs, sizes and colors, these kurtis are widely demanded by our esteemed customers. Further, at our in-house checking unit, these kurtis are checked to ensure flawlessness. 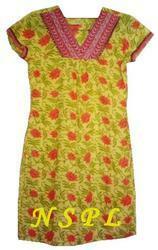 We are popular in the market for manufacturing and wholesaling Cotton Long Kurta. These cotton kurtas are designed and developed as per the details laid by our customers to attain their maximum satisfaction. 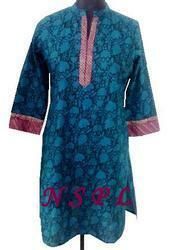 In addition to this, we offer these kurtas in wide options of colors and sizes to suit the demands of customers. With the aid of our well-developed infrastructure facility, we have been able to manufacture and wholesale a wide range of Cotton Long Kurtis. Our comprehensive collection is designed in adherence with the prevailing market trends of the market, keeping in mind the requirements of esteemed customers. Further, we are backed by a team of logistic personnel, which enable us to dispatch our range on-time to the customers' premises. Backed with rich expertise and knowledge of this domain, we have been able to manufacture and wholesale Casual Wear Kurti. This exclusive collection of kurtis is available in varied colors and patterns to meet the diverse demands of customers in efficient manner. 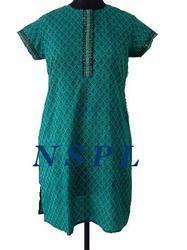 Furthermore, to stitch these kurtas only soft textured fabrics are used. 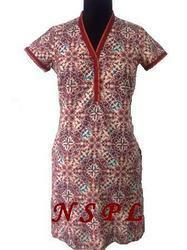 Understanding the demands of customers as a manufacturer and wholesaler, we are engaged in offering Fancy Cotton Kurta. At our end, these kurtas are designed and stitched with perfection under the supervision of experts, who hold extensive knowledge of this domain. Apart from this, quality is never compromised at our end to attain maximum client satisfaction. 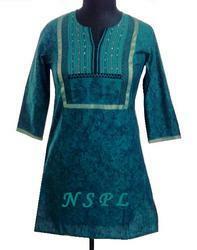 Supported by a team of diligent professionals, we have been able to manufacture and wholesale Ladies Printed Kurta. At our advanced and well-equipped manufacturing unit, these kurtas are stitched with perfection in adherence with the prevailing market trends. Apart from this, to attain maximum client contentment, we aim to dispatch our range on-time to the customers’ premises.